We asked for your help to shine a light on circus cruelty in the US and you have set the world alight with this campaign ! 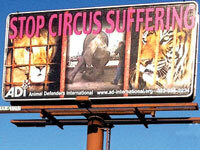 In Bakersfield, California, our grateful thanks to Stephanie Esla and her family for generously donating funds for a month-long ADI Stop Circus Suffering billboard campaign. In Fargo, North Dakota; Jacksonville, Florida; Agawam, Massachusetts; Anaheim, California; Ontario and Orange County and almost every far flung city in between, ADI volunteers have been out on the streets when the circus comes to town. Armed with our leaflets and posters, thousands of circus goers have been informed. Kathleen Stachowski made a presentation to the local school board in Butte, Montana, showing the animal suffering and urging them to reconsider distributing circus tickets. 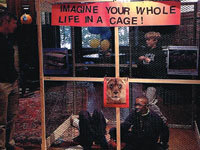 Whitemarsh, PA: After learning the story of 29 abused lions rescued by ADI from circuses in Bolivia Philadelphia middle school students Carlo and Sante Filippini and Alex Johnson came up with the creative idea to foster empathy for circus animals by spending time in a cage themselves. With the help of their teacher and ADI volunteer Gigi Glendinning the boys created an interactive “beast wagon” display in their school hallway to demonstrate the relative size of cage that lions and tigers must live in, and conducted a survey as people passed by. Parents, faculty and students signed the ADI petition urging the Whitemarsh Township Board of Supervisors to restrict the use of wild animals in traveling circuses. And the boys raised over $200 in donations for the ongoing care of the lions! The City of Glendale, CA told Ramos Bros. Circus they could not bring zebras, horses and other animals, except dogs and cats, when the circus returned to the city in November. 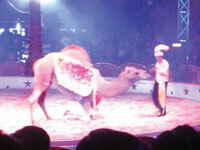 Last year, a camel escaped from Ramos Bros. while the circus was in Glendale. ADI lobbied Glendale City Council for a ban on wild and exotic animals and, partially due to last year’s incident, city officials made the decision to keep the wild animals out. However, more needs to be done as a City spokesman said that Glendale remain open to reviewing the use of animals at the circus next year, on a case-by-case basis. Hialeah Fair in Florida had Banana Derby Monkey Jockeys in November. This shameful act features monkeys dressed in costumes, strapped and chained to the backs of dogs who race around a makeshift track. Please contact the producers of the Fair, Wade Shows, and ask them to cancel this and other cruel animal displays at the Hialeah Fair and any future events. Send a polite email to owner Frank Zaitshik, Owner of Wade Shows, at frank@wadeshows.com. Contact us about getting a local ordinance on animal circuses in your town! Organize a Lion Ark screening.